Shelly Matthews questions the view that Luke-Acts was finalized as an early stage of a specifically anti-Marcionite program. I am one who has tended to see Luke-Acts as an initiator of a trajectory of proto-orthodoxy that can be traced through Ignatius, Justin Martyr, Irenaeus and Tertullian and that stood in opposition to the “heresies” of Marcionism, docetism, gnosticism. In the previous post we saw one of the reasons for Matthews’ view: the view of Jesus as calm and passive throughout his final hours and the unnatural concept of his flesh. Such a depiction would appear to have more in common with the views of docetists than what emerged as orthodoxy. Matthews further sees the Gospel of Luke as an attempt to subordinate other leaders, both women and men, who were looked up to as leaders by virtue of having had visions of Jesus. That is, the author was responding to more than Marcionism. In fact the gospel overlapped with Marcion’s gospel in key passages as we saw in our initial post. 14 And when she had thus said, she turned herself back, and saw Jesus standing, and knew not that it was Jesus. 15 Jesus saith unto her, Woman, why weepest thou? whom seekest thou? She, supposing him to be the gardener, saith unto him, Sir, if thou have borne him hence, tell me where thou hast laid him, and I will take him away. 16 Jesus saith unto her, Mary. She turned herself, and saith unto him, Rabboni; which is to say, Master. 17 Jesus saith unto her, Touch me not; for I am not yet ascended to my Father: but go to my brethren, and say unto them, I ascend unto my Father, and your Father; and to my God, and your God. 18 Mary Magdalene came and told the disciples that she had seen the Lord, and that he had spoken these things unto her. Matthews refers to Mary Rose D’Angelo who shows the structural similarities between Mary’s encounter with the risen Jesus and the elder John’s vision of the heavenly Jesus in Revelation 1:10-19. I have highlighted the significant passages in D’Angelo’s argument. John in Revelation likewise hears a voice and turns back to see the risen Jesus. Jesus negatively admonishes John in a way that draws attention to the divine nature of the one encountered in the vision. Both John and Mary are then given a commission to go and tell others what they have seen. And as per Paul’s qualification of apostleship, Mary, too, can and does say that she has “seen the Lord”. If we take our canonical form of the Gospel of Luke as having been completed after the Gospel of John (which a number of scholars do, and I often find myself siding with them) then we can readily interpret Luke’s depiction of Mary as an attempt to reject the status of Mary as an apostle. 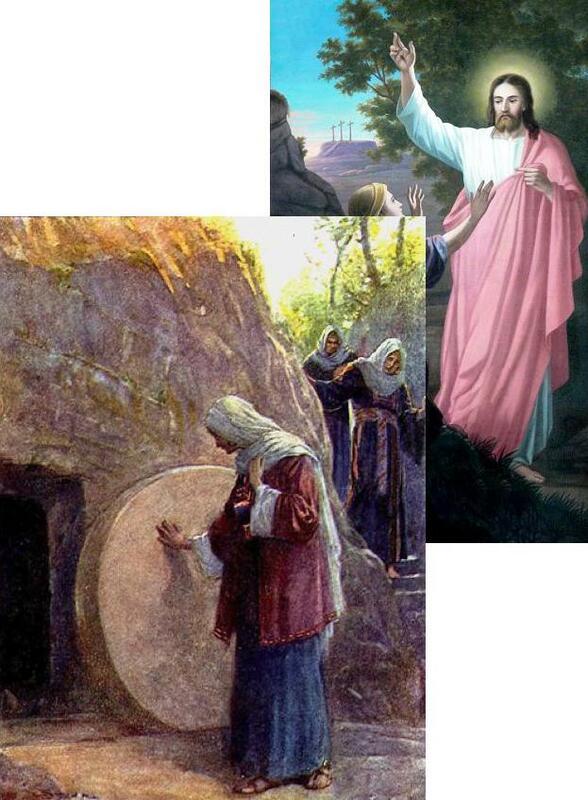 Luke “rewrites the tradition” by having Mary not seeing the risen Jesus but seeing only the empty tomb. Her encounter is with angels and it is only angels who tell her to go and tell the disciples that Jesus has risen. In Luke it is Peter who runs to find out for himself the truth of what Mary has reported and it is Peter who is the first to see the risen Jesus. That brings us to the Emmaus Road episode in Luke’s gospel. 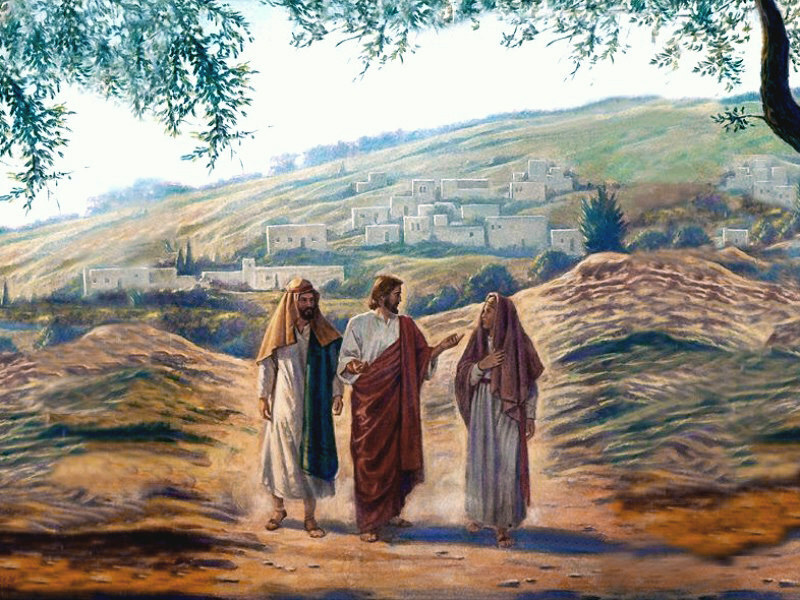 Here a couple, Cleopas and another unnamed companion, are walking along a road when they are joined by a third party they do not recognize. Their eyes are prevented from recognizing him, presumably by means of some spiritual agency. It is, of course, Jesus. The couple finally “recognize” who they have seen only after he disappears from them as they “break bread”. Matthews is one with scholars who interpret this passage as representative of what all Christians are to experience as they partake of the Lord’s supper. It is in that ceremony that they “see” Jesus. In this way the incident cannot be interpreted as a genuine vision of the risen Lord that qualifies one for apostleship. That is confirmed after the couple race to tell the disciples and are in turn themselves told that Jesus has already appeared to Peter. Even here Mathews believes we see further evidence of Luke reducing the status of women in the church. If we compare the two key persons on the Emmaus road with the Clopas/Cleophas (a Semitic form of the Greek Cleopas) and his wife Mary named in John 19:25 then it does look suspiciously the case that Luke has chosen to suppress the name of the wife involved in that famous incident. The Syro-Phoenician woman who in Mark 7 and Matthew 15 is commended for her faith to have her daughter healed is dropped from Luke’s gospel entirely. And this brings us back to the primary theme of Shelly Matthews article: the establishment of the Twelve as the ultimate earthly authority for Christians. The struggle for apostolic status was clearly associated with a gender struggle. Even in the noncanonical gospels (Gospel of Thomas and Gospel of Philip) we read of conflict over gender: Mary is a “mere woman” and accordingly, it is protested by the male disciples (and Luke), cannot have equal status. In order to demonstrate that the Twelve apostles have a higher authoritative status over all other apostolic claimants the final author of Luke-Acts makes it clear that only the Twelve had seen and been with Jesus both before and after his resurrection in his fleshly body. All others had only seen the half, so to speak, the vision of the risen Lord. Not even Paul had a privileged status beyond that of the Twelve. Acts 1:4 On one occasion, while he was eating with them [i.e. the apostles he had chosen — 1:2]. . .
Acts 10:40-41 but God raised him from the dead on the third day and caused him to be seen. He was not seen by all the people, but by witnesses whom God had already chosen—by us who ate and drank with him after he rose from the dead. 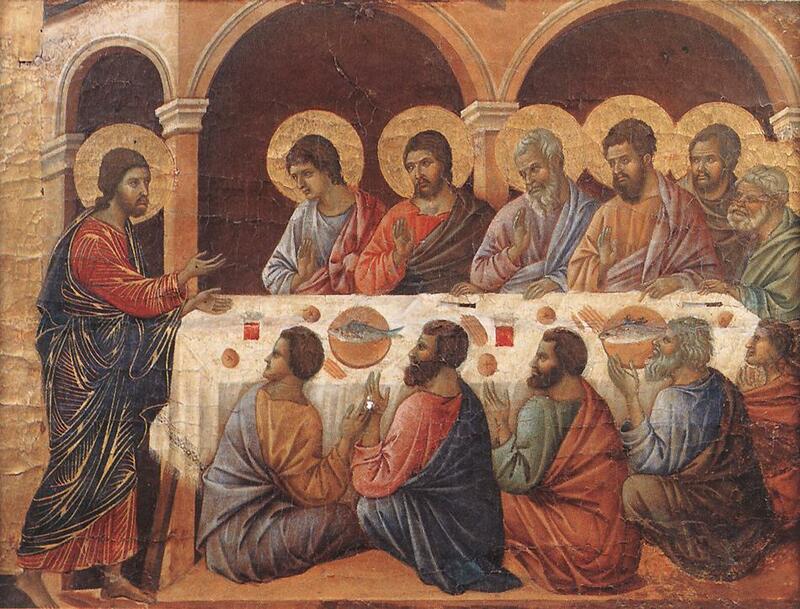 In the above two passages we learn that it is the apostles and only the apostles (who had been with him prior to his death) who ate with Jesus after his resurrection. We have already seen the more detailed account in Luke 24 of Jesus eating in front of his disciples. 9 And [Mary et al.] returned from the sepulchre, and told all these things unto the eleven, and to all the rest. 10 It was Mary Magdalene and Joanna, and Mary the mother of James, and other women that were with them, which told these things unto the apostles. . . . .
36 And as they [Cleopas and his companion] thus spake, Jesus himself stood in the midst of them . . . . So in Acts 1 when the replacement for Judas is to be chosen they can select from a group who had been with Jesus thus preserving the integrity of the Twelve. Acts 2:31 Seeing what was to come, he spoke of the resurrection of the Messiah, that he was not abandoned to the realm of the dead, nor did his body see decay. Acts 13:37 But the one whom God raised from the dead did not see decay. 16 Then Paul stood up, and beckoning with his hand said, . . .
31 And he was seen many days of them which came up with him from Galilee to Jerusalem, who are his witnesses unto the people. For the above reasons Shelly Matthews submits that Luke-Acts was written before the time when the clear precursors of orthodoxy were arraigned against the docetic Marcionites and other such “gnostics” and is part of the “riotous diversity” of beliefs seeking its own way out through its own pathway. The final author portrays a Jesus who is in command and does not writhe in anguish in Gethsemane, a Jesus whose flesh is flesh but at the same time with some sort of divine quality that makes it incorruptible even after death. Our author contradicts Paul’s claims of having a special status as an apostle because he had visions of the risen Jesus and also his teaching that flesh and blood cannot inherit the kingdom of God. Similarly, he denies Mary apostolic status and even her visions of the risen Jesus. On the contrary, our Lukan author makes it clear that the ultimate earthly authority for the followers of Jesus are the Twelve apostles who were with Jesus before and after his death and who were his companions in his uncorrupted fleshly state right up to the time of his ascension into heaven. Their experience preceded any of the subsequent visionary experiences others had of the risen Jesus. The Twelve, because their time and experience had been with the uncorrupted fleshly Jesus either side of his crucifixion, were set up as the source of the authoritative teachings above any other claimant, even Paul and Mary. It follows that that experience of the Twelve was unrepeatable. It shut out from any privileged authoritative status any rival claim by others who could claim to have since seen the risen Jesus. D’Angelo, Mary Rose. (2005). “I have seen the Lord”: Mary Magdalen as Visionary, Early Christian Prophecy, and the Context of John 20:14-18. In D. J. Good (Ed. ), Mariam, the Magdalen, and the Mother (pp. 95–122). Bloomington, IN: Indiana University Press. Matthews, S. (2017). Fleshly Resurrection, Authority Claims, and the Scriptural Practices of Lukan Christianity. Journal of Biblical Literature, 136(1), 163–183. Posted on 2018-05-03 02:49:05 GMT+0000 by Neil Godfrey. This entry was posted in Biblical Studies and tagged Gospel of Luke, Shelly Matthews. Bookmark the permalink. Do you have an argument that critically engages with the post? Can you tell us why you appear to find Trobisch’s arguments a stumbling block for the points made by Matthews? The Emmaus road episode repeating theso-called Josephus Testimonium almost word-to-word, I wonder what role Eusebius may have played in producing Luke-Acts. That’s another question, yes? Do you have views on Shelly Matthews’ arguments? I’m reassured by the above two comments that I have not simply repeated and added cement to views that are already held by some readers. Hopefully this current set of three posts will provoke new thoughts about the evidence for early Christian texts and raise questions about views long held with apparently little questioning. Hi Neil: Do you think it likely that the parable of Lazarus in Luke 16.19-31 is some evidence of Luke being proto-orthodox or Marchionite? Mark starts out with no miracles will be given as evidence that Jesus is the Messiah (Paul says none were given to the Jews either) then Matthew concedes and allows one, then Luke repeate Matthews story and adds the parable and Acts 2, then finally John creates from the Lazarus parable a full-blown historical event, the ultimate miracle. What would become orthodoxy believes miracles proved Jesus was the messiah right? Did Marcion believe no miracles would be given? Or maybe Shelly Matthews is correct and this passage is part of that “fluid” period. I have come across some very good arguments (in my opinion) that Luke was written after John and that he rewrote much of John, including rewriting John’s Lazarus mircacle as the parable of Lazarus and the Rich Man. So we cannot be sure that there was a trajectory from Luke to John. As for Paul, I don’t think we have any evidence to suggest that he had any knowledge of any narrative about Jesus that we find in the later gospels. He did preach that the death and resurrection of Jesus was, in effect, a sign to the Jews. Matthew speaks of the same sign to the Jews, as you point out. Marcion’s gospel certainly believed Jesus performed miracles, but he did not allow for the Jonah sign to the Jews, it seems, because his Jesus did not come to fulfill any “Old Testament” prophecy. So the framing of your question is not necessarily a secure representation of the background to the question. Luke’s parable of Lazarus is also very much one with a larger theme running throughout the final canonical form of the gospel, and that is the theme of reversal of fortunes. The same theme is found in the apparently anti-Marcionite introductory birth chapters (God is said to cast down the mighty and raise up the lowly, such as Mary herself). So I am not sure that the Lazarus parable by itself is evidence of being akin to Marcionism. Thanks for your reply Neil. My apologies for the framing of the question. Is there a link or book you could point out to me on the Luke writing John info you provided? The earliest gospels . . .. I suspect the Gospel of Luke was not composed from scratch after the other three gospels but that an earlier form of a “proto-Luke” was revised to look like our form of the canonical gospel by the same person who wrote Acts — around the mid-second century. Thank you for the links Neil and for your site in general. I learn something almost daily here.